Have you got a sail boat, a catamaran, a kayak, windsurf or paddle surf and do not know where to leave it? You can leave it with us on the beach. The sails and accessories will be store in our warehouse. Boards can be left in our racks and you can leave a windsurfing sail mounted in the shade of the tent. We have everything in hand so you can go sailing any time you want. Continuous surveillance, fresh water to clean up whilst enjoying a nice atmosphere where you can exchange your knowledge and seamanship in an environment ideal for water sports such as Sant Pol – S’Agaró bay. The duration of the stays is accounted for by the number of nights spent on the beach. For longer stays of one month the proportional part of the monthly fee will be applied. Call us or email us to make your reservation. All costumers have to read and sign document shown above. next we inform you about mandatory rules for conviviality and safety of all beach users, without prejudice of compliance of all safety and navigation rules and regulations applicable to your sport. Under no circumstances allows you to navigate within the bathing area. The entrance and exit of the beach will always be done within the limits of the channel marked with buys for this purpose. Navigation through the buoyed channel will take place at reduced speed (max. 3 knots), paying attention to other channel users, particularly windsurf, kayak and child sailing boats. Beach arrival will be at the lowest speed possible with attention to bathers who walk along the seashore. Not allowed to leave the boat with the sails mounted or windsurfing sails on the sand without owner´s supervision. All of 5 meters of sand closer to seashore will be occupied just at the time of entry or exit to the sea, leaving free that zone as quickly as possible for other boats who want to enter or exit. The user is solely responsible for safely navigation according to the weather and sea conditions, their skills and their boat conditions. 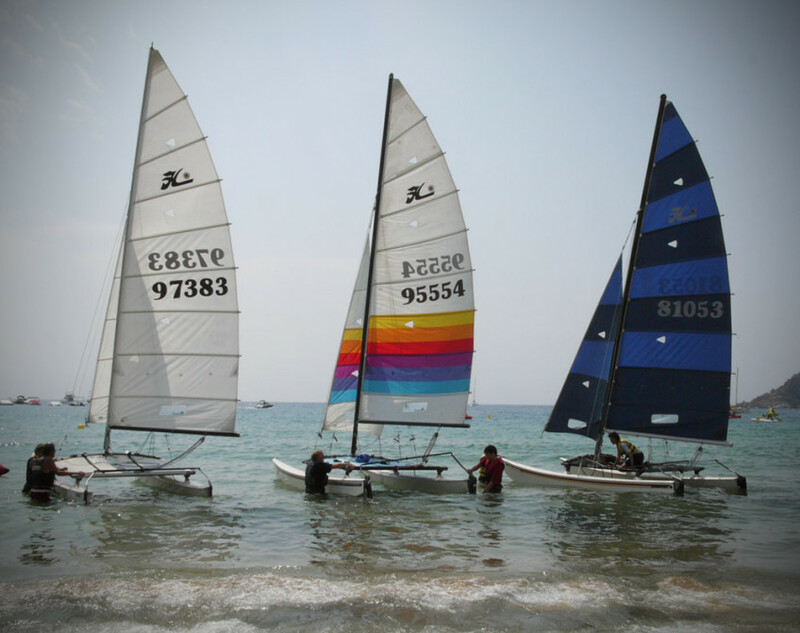 Compliance will be given to all instructions given by the managers or employees of the sailing school, especially those concerning to safety issues, enter or exit on the channel or placement of the boats on the sand. The user is solely responsible for the smooth maintenance of his boats, with special attention and cares of all safety elements and in the case of catamarans ensures the correct attachment of the mast both on the beach and at sea. The boat will be used exclusively for recreational purposes. It is expressly forbidden any professional or for profit use. Signed as I’ve read, I know, accept and will comply these rules. NOTE: The rules and regulations of Sant Pol-S’Agaro bay does not allow motor boats on the beach for individual use.